From boycotts and letter-writing, to marches and rallies, activism has many faces – and has achieved much success throughout history. But the culture and identities often associated with activism can seem angry and ‘anti’, putting some people off. Could ‘gentle protest’ be a more accessible, and perhaps even more effective, way to campaign? “If we want our world to be more beautiful, kind and just, then our activism should be beautiful, kind and just,” says Sarah Corbett, founder of the Craftivist Collective and headteacher of the School of Gentle Protest. This March and April, the organisation I’m working with – 1215.today, an online platform that engages young people with political and social issues – partnered with Sarah to deliver The School of Gentle Protest, a six-week curriculum of vlog-based lessons, learning resources and homework covering the gentle protest movement. As Sarah suggests, isn’t it time that activism better reflected the kind of world people are trying to create? Instead of being owned by a media mogul, Positive News is owned by the many. We are a community benefit society (a form of co-operative) accountable to our readers, and any profit we make is reinvested back in our journalism. In today’s media-saturated world, the heavily-wrought analytical infrastructures upon which our opinions rest are primed for a gentler approach. Marshall Rosenberg, the late US psychologist and mediator, believed that ‘a difficult message to hear is an opportunity to enrich someone’s life’. Starting in the early 1960s, Rosenberg developed Nonviolent Communication, a process for resolving conflict within people, in relationships, and in society. Rather than getting bogged down in analysis, Rosenberg’s approach crystallised the core of conflicts: he focused on creating empathy and resolution rather than anger. Building on Rosenberg’s idea about the enriching potential in ‘difficult’ viewpoints, the gentle protest approach encourages us to make ‘critical friends rather than aggressive enemies’. Taking the example of an acquaintance making a sexist joke, John-Paul Flintoff (a journalist including for Positive News, and a teacher in ‘the art of conversation’) advises us to ask questions in a friendly way. For example: “Wow, did you mean for that to sound so rude?” By asking open-ended questions you can keep the mood amiable and express your true feelings. Anger can further alienate people and solidify their opposing views. But coaxing them into a self-revelation is more likely to allow them to digest the situation and carry their new perspective through to their own interactions. From signing online petitions to applying filters to profile pictures, there are myriad ways to mark the activist tick box from home. However, their immediacy can mean that, though well intentioned, these methods are not supported by the thoroughness of thought that serious issues require. A vital string in the gentle protester’s bow is craftivism, in which people use craft as a tool for influencing long-term change. Craft involves a certain level of focus and solitude, and the calmly formed musings that come out of these moments of reflective making can carry through to our lives more profoundly than a few clicks online might. 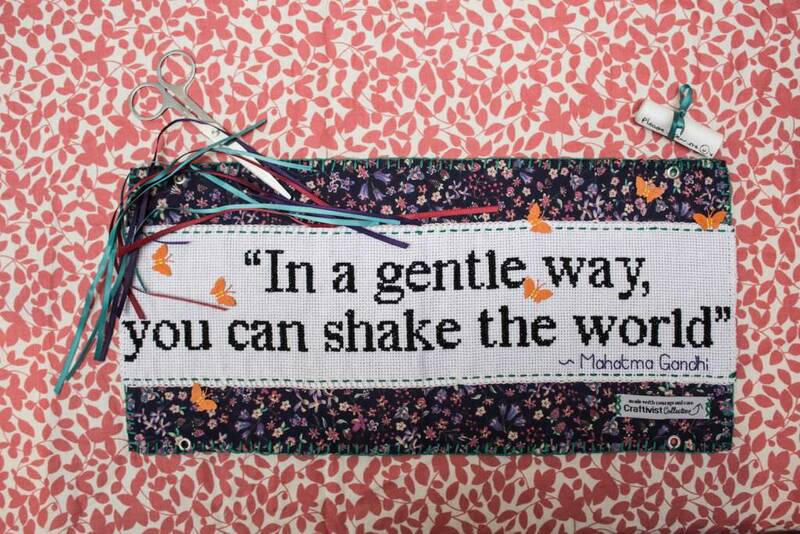 The products of craftivism are also so unusual that they evoke a unique level of engagement from those who see them. Fostering an ongoing relationship with someone as their critical friend allows deeper, lengthier connections to be made than those you might forge with an aggressive enemy. In 2015, the Craftivist Collective partnered up with ShareAction, a charity dedicated to responsible investment. They wanted to address the Marks & Spencer’s board members at their AGM and put the Living Wage on the retailer’s agenda. Armed with 14 Marks & Spencer handkerchiefs customised with messages tailored to each board member, the Craftivists let their gifts set the tone of the conversation. Marks & Spencer’s chairman said the campaign was ‘a test case for how these campaigns should be run’ clarifying that it was the manner and tone of their approach that made the board so willing to meet in private and chat. Marks & Spencer eventually increased their staff pay above the Living Wage, a move owed in part to the positive attention the handkerchief campaign drew. Marks & Spencer increased their staff pay to the Living Wage and Craftivist Collective is now campaigning for Marks & Spencer to achieve Living Wage Employer accreditation. Another concept discussed during the School of Gentle Protest’s term has been that of visible mending. Breaking away from the wasteful consumerist treadmill borne of fast fashion and expendable incomes, is Tom van Deijnen, founder of Visible Mending. Some of the great champions of peaceful protest, such as Gandhi, are extraordinary in part due to their oratory abilities and resilience to pressure. But simply marching – parading your values in public – can prove too daunting for some people. Anyone can pick from the array of techniques covered by the School of Gentle Protest. Introverts, extroverts, talkers, doers and thinkers; gentle protest can come in every size and shape. For less than the cost of a coffee each month, you can back quality, independent reporting about progress and possibility.